"'Special Times' is a lovely, gentle, slow-moving piano album that will melt your worries away with the start of each piece. Originally released in 2005, this was Jason's first official CD release. The new 2011 album has been completely remastered and contains a new track: "The Enchantment", as well as a cinematic mix of "Summer in Athens, OH". Track 11 "A New Beginning" has also been reworked, now as a straight piano solo. The CD sleeve design is also brand new, with fresh Springlike colors and family-themed imagery. The album has a similar feel to the instrumental piano music of the 1990s Wyndham Hill label, but with more classical nuances. Additionally, each piece on the album was composed using a cinematic approach, reminiscent of a film score, rather than all the tracks simply blending together as 'background music'. As a result, each track is its own entity, with a unique theme independent from the next. Jason has the ability to constantly reinvent himself and create an entirely new sound that's refreshing and engaging. His enigmatic presence makes him an original in this day and age of copy-cats and one-hit wonders. Thanks to his well written pieces and inimitable stage presence, Jason is a breath of fresh air in a smog infested LA and for this, we can all have a big sigh of relief knowing Jason Farnham is an artist who respects and maintains his artistic integrity, continuing to push boundaries and find a voice that is unique and a feverish delight to the ears of music enthusiasts everywhere." 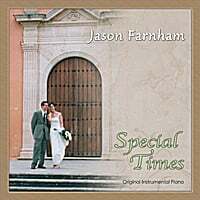 "Jason's new instrumental piano album, "Special Times", is soul-soothing music....It's the kind of soothing album to put on after a hectic day at work, or while attempting to wake up over morning coffee...The 30 year old musician is nothing if not diverse."